More than thirty guests assembled at Oscar’s Hotel for the official presentation of the 2018 Junior Female Cyclist Support Grant Program. 2018 marks the tenth anniversary of the formation of the Eureka Veterans Cycling Club. The club was formed to provide an avenue for mature riders to race competitively. Club Vice President – Dean Wells – announced that KREHALON Australia had uniting with Eureka Cycling to increase the scope of the 2018 grant. 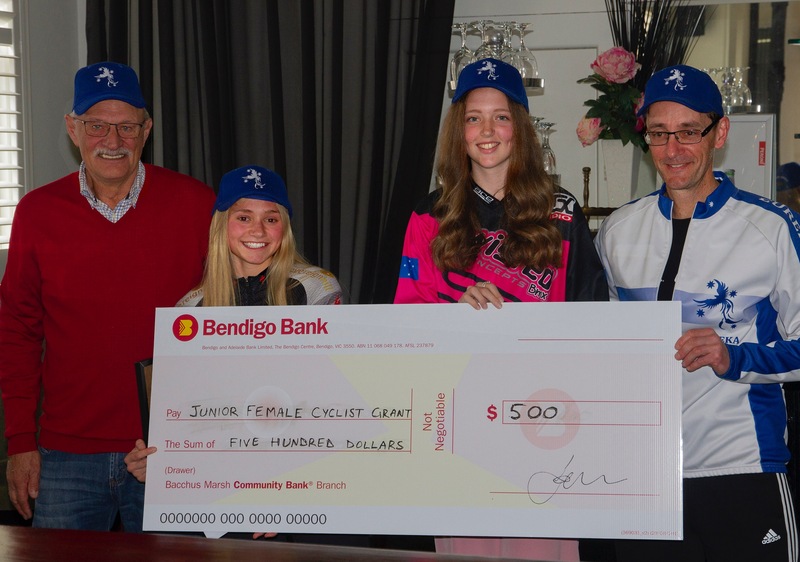 Earlier this year, Jonathon Delaney from KREHALON Australia, discussed the lack of sponsorship available for female cyclists with the Eureka Cycling President – John Faulkner. Frustratingly, the lack of support is prevalent at all levels, across every cycling discipline, both domestically and internationally. It has led to lower participation rates of females in cycling. This is also quite obvious in the veterans cycling ranks. 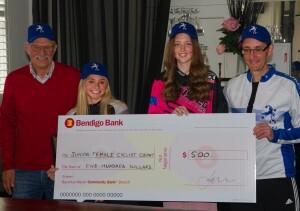 From that conversation between the two Johns, the idea of the Junior Female Cyclist Support Grant Program was born. Simply, Eureka Cycling wish to contribute, to the future development of the sport of cycling. 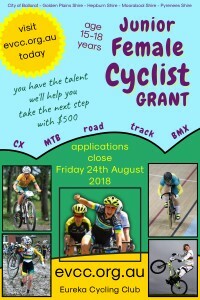 In particular, the club will provide monetary support to promote junior female cycling and to assist the chosen athletes to compete, develop and realise their potential. Guest speaker – Melissa Burgoyne – spoke about her journey in sport through swimming, triathlon and now cycling. Melissa’s words of encouragement to the girls were both inspiring and well received. 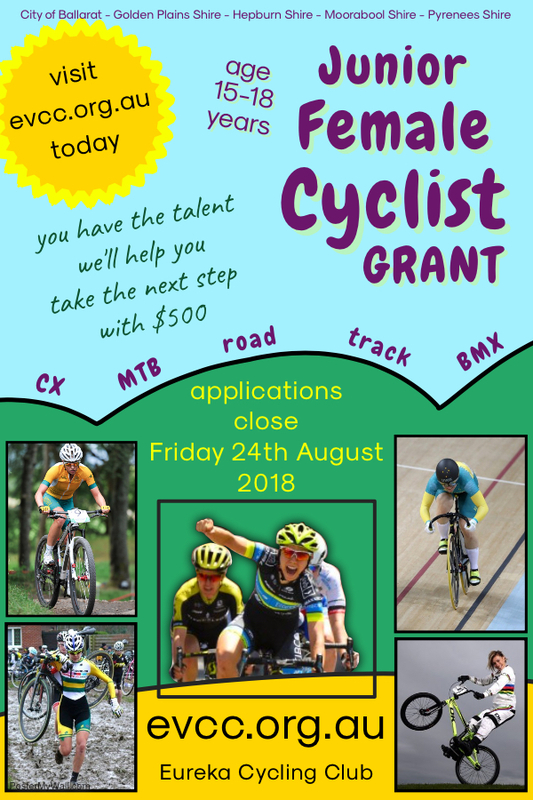 The recipients of the 2018 Junior Female Cyclist Support Grant are? Shallan Pompe and Alaya Humber. Each of the grantees received a cheque for $500. *Interestingly, both Shallan and Alaya followed a younger sibling into the world of cycling. Shallan races BMX and is a member of Ballarat Sebastopol Cycling Club. Shallan has been riding BMX for about 7 1/2 years. Shallan and her brother Damon, are both members of the Twisted Concepts BMX team, which is based in the United Kingdom! Shallan is a role model at the BMX club. The younger kids look up to her because she spends time with them and helps them with their craft. Also, she is a pretty mean BMX racer! Off the BMX track, Shallan has been identified by her school as a leader. She travelled as a school ambassador, with other students to China during the year. 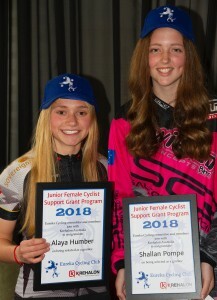 Due to illness, Shallan has missed some races during 2018, however, she is aiming at the Victorian BMX – State Championships which are being staged in Warrnambool in November. Alaya is relatively new to cycling. She has quickly made an impact and is a member of the same clubs as her sister Iesha. The sisters are members of Rode Rage and compete in Human Powered Vehicle events. They are also a members of Ballarat Sebastopol Cycling Club and compete in track cycling and road cycling. Both Alaya and Iesha are a members of the Sovereign Hill – Track Cycling Program. In Alaya’s short track career – under the tutelage of coach Damien Keirl – she has already claimed a number of podium results. Gym work accounts for 50% of a track rider’s preparation and Alaya is currently powerlifting around the National record for her division. Coach Keirl has indicated that an attempt on the record could very well be on Alaya’s horizon. Alaya has been identified as a leader by her school and has been performing as a Teacher’s Assistant. She takes Year 7 students for their sports program. Alaya is currently training towards the Victorian Track Championships which are being staged in Melbourne in December. Eureka Cycling and KREHALON Australia will be following the girl’s exploits as they continue with their cycling journey.